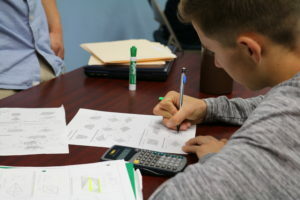 Math Advance is a course that focuses on solidifying a strong foundation for the upcoming academic year. First, we assess our students to make sure that all concepts covered in the previous academic year have been mastered. Second, we re-teach any concepts until the student can score in the 90 percentile. Once this first phase is accomplished we start our course by teaching from the outlines below a different concept every week, following up with a weekly homework assignment and a pre-lesson Quiz to make sure the concept has been retained. The material covered is based on the upcoming year’s core concepts with the goal that these bases will catapult students into success in the upcoming year.